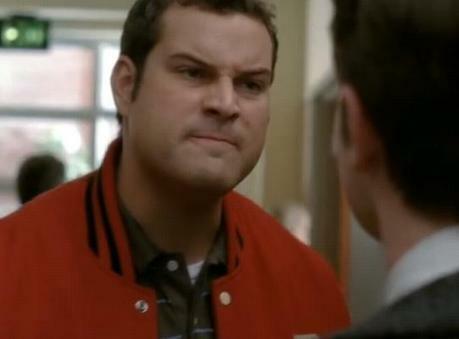 Homohobic gay football player David Karofsky from Glee. I read reviews. Once in a while, I Google myself (I know God says it’s wrong, but I’m human! ), and I read blog reviews of Openly Straight. And I will occasionally (read: fifteen times a day) peruse the reviews on Amazon and Goodreads. I know there are authors who say this is wrong and a waste of time and energy. They are right. So are the people who say sugar kills. This has not stopped me from eating the chocolate cake at Wally’s Pub in Arcadia. Sooo gooood! So this morning I read a new Amazon review, and it fascinated me. What fascinates me about reviews is that they tell me as much if not more about the writer than they do about my book. Like there was the reader who sent me an interview for a column who wondered why I had created a bisexual character. I’m open to the idea that my character is bisexual, but it simply had never occurred to me to label him as such. The reader did that. The reader’s frame of reference includes thoughts about the label bisexual, and that’s what she took from reading the book. That’s what my book brought out in her. Some readers have been so happy that I had taken such pains to create likable parents. This tells me about their frame of reference as much as it does about my intention. I’m glad the parents are likable, but I didn’t set out to create them that way. They just are. Which brings me to the review from today. It brought up an issue that was raised in a few reviews of Out of the Pocket. “A key element of my frustration with the book was Konigsberg’s handling of the central character, which was confused and somewhat hard to decipher. I’m not bothered by Rafe’s decision to avoid outing himself at his new school. But the novel merges this idea with the idea that Rafe is only attracted to straight-acting men and not only can’t get interested in a more flamboyant sort of male, but actively can’t stand being around them even as friends. And in fact it’s hard to tell how much the author intends these two concepts to be thought of as one. Thus it is difficult to know how to read Rafe’s antagonism towards any gay kid who is the least bit effeminate or unattractive. He frequently goes on about how these guys just aren’t his type, and he and the kind of guy he’s into probably seem boring to them and it just so happens that he fell in love only with a big meaty soccer player and that probably those other gay guys wouldn’t even like that type. But clearly Rafe is only interested in men who don’t seem remotely gay and with one exception, he doesn’t want to even be acquaintances with gays who are the least bit obviously so. There’s one exception, but that almost seems like a case of tokenism. And a broad-shouldered powerful jock with meaty thighs is EVERYBODY’S fantasy, not just his own unique preference. Now to be clear: I have no issue with this take. At all. As a self-centered human being, I am often fascinated with the insights people have about my novels and how they relate to ME, the author. So I read it not angrily, not in the least. The title of this blog is not about the reviewer, but about the issue he raises. About gays who only like “straight-acting” men. I read it thinking: did I create a homophobic gay teen? Because it wasn’t my intention to do so, exactly. I wanted Rafe to have issues, as we all have issues. His homophobia wasn’t central to my thinking. Are these critiques valid? Does Rafe only like “straight-acting” guys? And is that a thing? And if it is and he does, is that homophobic? I don’t know the answers to these questions. I do think that the writer has taken some of his own issues and superimposed them on the book, because I’ve not heard this critique before. First off, I think Rafe isn’t entirely “straight acting.” I love the guy, and I want to take him out for ice cream, and it isn’t because he’s superbly straight acting. When he comes out to his best friend (a female, by the way), her response is, “Duh.” In fact, what is “straight acting”? A deep voice? An affinity for motor sports? A distate for facial products? I wrote about this issue a year ago on my blog, addressing the need some people have to label gay couples using outdated straight terms, such as, “Who’s the man? Who’s the girl? And I disagree strongly that Rafe feels antagonism for anyone. I think he’s way too laid-back to feel that way. I have to believe that’s about the reviewer, not the book. But as I always say, perhaps I’m wrong. And maybe his attraction to guys who are more “straight acting” is homophobic. Is it? What do you think about this? Is Rafe a homophobic gay person for being attracted to Ben? I think it’s natural to be attracted to certain “types” and not others. That in itself doesn’t make you blank-a-phobic. If Rafe isn’t sexually attracted to effeminate men, that doesn’t make him homophobic. On the other hand, if he thinks less of person because he’s effeminate, that would make him homophobic. Right, I agree. And for that reason, I don’t consider Rafe homophobic. Perhaps at the beginning of the book he has some of those feelings, in that he labels people. But he labels EVERYONE. It’s not just Toby, it’s Albie, who is straight. Certainly he gets over those feelings quickly. I read OPENLY STRAIGHT on vacation a few weeks ago and really enjoyed it. I got the impression that Rafe was only attracted to masculine guys, but not that he was homophobic in any way; in fact, I tend to only be attracted to masculine-ish guys, and calling me homophobic would be just about the funniest/most tragic thing ever. If anything, Rafe is simply SELECTIVE. Ha! I like that word. Yes, he likes what he likes, and that shouldn’t be a problem. We all like what we like. Madison nailed it above. We all have our “types” we are most attracted to … although the life partners we eventually end up with are often 180 degrees different from that. Gay men might express an attraction to redheads, short men, Asians, hairy guys, etc., but you don’t hear brunettes, tall men, other races, smooth guys, etc., claiming discrimination or (fill in the blank)- phobia. Hell, we’re attracted to other males, and that doesn’t make us female-phobic, does it? It is what it is, a preference, not a political statement. I have a friend who uses the term “sexual racist” jokingly. He is a white guy, and he has a preference for white guys. To me, I just find this stuff interesting. No strong opinions, just interest. I agree that our preferences aren’t a political statement, especially because they can’t really be changed. I think it comes down to how we treat other people. I don’t need to be sexually attracted to everyone, but I do need to recognize that all people, regardless of race, color, creed, nationality, sexual orientation, are people. I agree with Madison. I read that review today, and commented on it bc it helped me decide to purchase openly straight. I feel as though the late craze in gay culture over masculinity is due to the fact that most gay guys see a chance to enter into the normal zone with heterosexual ppl, so they’re gay-bashing fem guys bc they think femininity makes gays look bad to the whole of society. That’s wrong, and pushing your personal views on someone is an oxymoron. They’re called “personal” for a reason. I also think that the much more potent reasoning for the push for masculinity stems from the (reluctantly admitted) fact that most gay guys are in crisis over the whole bottom/top thing. And fem guys are basically the epitome of a total bottom, and ppl are fighting against that. Everyone wants a big juicy guy to sweep them off their feet, even some “straight” men. But the simple fact is; everyone wants to “get it” but no one wants to “be it.” Nobody wants to be constantly leaned on by their lover emotionally or otherwise, but so many ppl want to lean on someone and feel protected from those hard days that come to us all (even those big juicy guys we all desire so much). But, if we all take a little time to flush out our own feelings as certain individuals, I’m sure that need will flutter away, and we can stop berating one another into conforming to the fascist idealism that only masculine beings deserve respect (women had to deal with this BS for so long and still do today) and praise. You get the award for most intriguing comment! The part of it I most agree with is that there’s this break between LGBT folks who long for acceptance and to be part of the “normal” fabric of society, and there are LGBT folks who want nothing to do with the culture that has long repressed us. As for that whole top/bottom thing, I may be reading this wrong but I feel like you’re buying into traditional roles for men/women and masculine/feminine that actually NOT all gay men agree with. As I wrote in the old blog post linked above about “who’s the girl,” I think that as I’ve gotten older I’ve come to peace with a lot of these concerns that drove me crazy in my teens and 20s. I used to be petrified that people would think I was “less of a man” because I was gay. And so much of that related to this idea that men penetrate, and women are penetrated. In my experience in the gay world, this is a myth. I know masculine gay men who only choose the “bottom” role, and more feminine gay men who are only “tops.” Those sexual roles have little, if anything, to do with masculinity and femininity. I love this thread. It proves art makes great conversation. I thought the notion that only straight guys can have true male friendships intriguing. And Rafe’s quest became truly believeable. Actually giving him a love, I would have thought impossible, but the brief affair resonated with the closeted affairs of my youth. But were I reading this journal I would have wanted you to pursue the notion that the first impression Rafe left was that he was a liar. In any case, I thank Barnes & Noble for putting the book at the front of the store so I couldn’t miss it. I think your use of multiple gay-or-“something-along-the-alphabet” characters in Openly Straight defies the accusation of homophobia in the main character (and in yourself, though I don’t think that was an accusation). The way you’ve written you have: Rafe, Robinson, Toby, Caleb, Ben and the members of the GSA who all are completely different non-straight characters that have complex relationships with the people around them. Rafe isn’t drawn to the athletic Robinson, but Toby is. Caleb and Rafe aren’t friends though they are both gay and spent years at high school together; they just don’t get along. Ben has been surrounded by gay athletes and geeks for years at Natick and has never developed an attraction to or an intimate relationship with any of them. If anything, I feel like your book did well at making your characters and your readers rethink labels. Femininity and masculinity are not absolute and it’s absolutely demonstrated in your writing. Thanks, Megan. I agree… I think the question implies some things about labels like masculine and feminine that are more black/white than I see them. And given that stereotypically masculine guys are not supposed to have feelings, Ben doesn’t meet that, anyway.